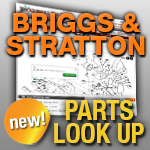 We have Small Engine Tools to help you repair your Briggs and Stratton engines. For the major components of your small engine, we carry bearing tools, carburetor tools, cylinder tools, spark plug tools, starter tools, and much more. Pick the tools you need to fix your equipment and keep it running like new.